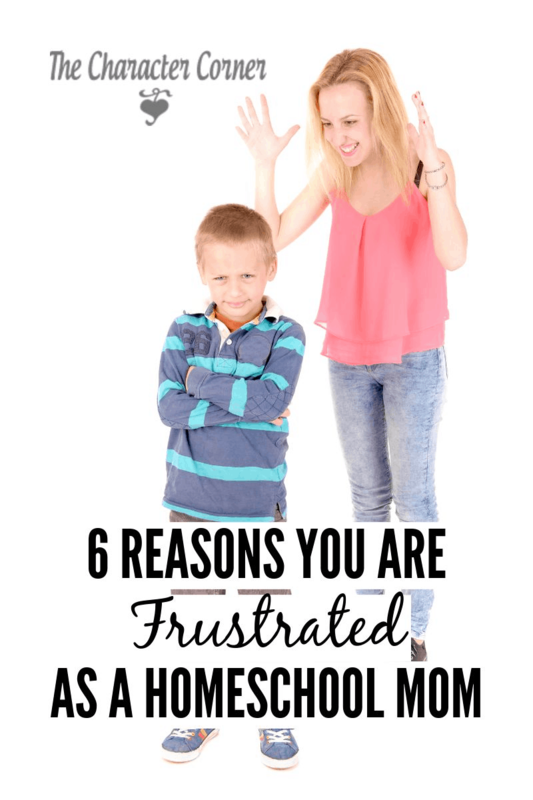 Are you FRUSTRATED as a homeschool mom? It is normal for all of us to have times of frustration; however, it shouldn’t be a constant thing. God meant for our children to be a blessing and a joy to us, not a burden that stresses us. 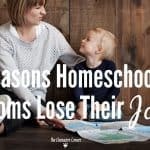 If I am constantly frustrated, I am not going to enjoy homeschooling my kids, or being with them. Therefore, when I find myself feeling this way, I try to identify the cause. Once I know what is causing it, I am able to work on a solution that will take away that frustration. If your children haven’t learned to obey you and are out of control, you will be constantly frustrated. Trying to teach them anything academically will be very stressful. Every day you will fight the battle of their will. Your children need to learn to listen and obey the first time they are told, without question. If you need to, take a short break from the academics and work on the obedience. You can’t teach a child who won’t listen or obey. Be consistent in requiring obedience, and don’t get frustrated when you have to stop and train them in this area. Don’t let it upset you, but rather remind them what obedience is and practice the right response. Discipline and training are not interruptions in your day, but are opportunities to take them to God’s Word, and show them what HE says about it. One of the reasons we home school our children is so we can daily work on their attitudes, and train them in Godly behavior. It’s more important than getting all the academics done for the day. If they get all their school work done, but have had a disobedient attitude the whole time, it really doesn’t mean much. I’d rather they finish only half of their lessons with a good attitude! 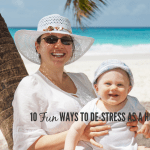 If my kids are weak in certain areas of character, it can make things much more stressful. For example, if I am trying to teach them, and they haven’t learned to be attentive, it is very frustrating to me. I can’ teach them anything if they aren’t paying attention. If they haven’t learned to be diligent, getting academics done daily can become a source of frustration. Making it a top priority to work on character training and development when the kids are young, will reap great results and make the later years much easier. I believe the harder you work on teaching and training your children when they are little, the easier your job will be later. This is probably one of the things that frustrates me the most! It can be overwhelming when the kids are continually teasing, tattling, bossing, putting each other down, etc. However, as I have told my children often, God put each of them in our family with their unique personalities, to help each of us learn and grow. There are daily opportunities to learn to treat each other kindly, respond properly to irritations, practice self-control, and be a peacemaker. Dealing with the sibling rivalry and conflicts isn’t always easy, but it will make your home much more peaceful , and help your kids develop skills that will be valuable when they become adults. Sometimes we put a lot of unnecessary pressure on ourselves, and expect more that what is truly realistic. This often stems from comparison. Don’t allow yourself to compare what you are doing to what someone else is doing. You and God know the situation you are in with your family. Ask His wisdom on teaching and training your kids, and get His direction on what matters. Realize you can’t do it all, so you need His direction. It’s also common to get frustrated because we are unrealistic in what we expect from our kids. It’s important to remember that each of them are different, and have different learning styles and abilities. It’s okay if one takes longer to read or learn their math facts than another. Be realistic in your expectations with each child, and it will save you from a lot of frustration. Getting organized will make a huge difference in your productivity each day. There’s nothing more frustrating than starting your day off looking for school books, paper, or pencils. Having your kids running around doing their own thing because there is no structure, will add to the confusion. It is well worth it for you to set aside a block of time to organize your time, and make a weekly schedule for everyone to follow, that includes household management. Keep in mind that the schedule is a tool, and not your master. It’s a way to incorporate your priorities and goals into each day, and accomplish the things that matter. I would suggest not worrying about exact times, so much as a routine to follow each day. Allow for flexibility as needed. Life is busy, and we all face the challenge of having to choose which things to say yes to, and saying no to a lot more things than we say yes to. We can’t do it all. Busyness is a homeschool mom’s greatest enemy! When I get too busy, it crowds out my relationship with the Lord, and with others. When our days are full with activities, it stresses each member of the family. Being too busy also increases our physical fatigue, and often our health suffers. The answer lies in making wise choices. Go to the Lord and ask Him for His wisdom and guidance as to what HE wants for your family, and how He wants you to use your time, and spend your days. Seek Him when deciding what activities to be involved in. Go to God and seek His priorities daily. 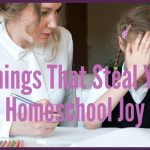 Homeschooling may not always be easy, and there will be times of frustration. Stay encouraged and excited about the eternal value of the job God has trusted you with as you raise those blessings for Him! 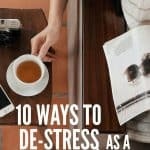 I am so glad I found this article! I have been way beyond stressed and everyone feels it. There is so much yelling and just chaos. I hate it! This is not what I pictured homeschooling to be like. I know it’s not going to be perfect but it hasn’t been a good experience the past few months. I it can be and I desperately want it to be!! As I read through this article 5out of the 6 things are happening right now. Any suggestions on what to do to get peace back in our home and the joy of being together and learning back?